Mary Evelyn Yedinak, 97, of Streator passed away Thursday, November 22, 2018 at her residence in Streator. Mass of Christian Burial will be at 10:00 A.M. Wednesday, December 5, 2018 at St. Michael the Archangel Church, Streator. Msgr. Philip Halfacre will officiate. Visitation will be from 9:00 A.M. until the start of services on Wednesday, December 5, 2018 at the church. Burial will be in St. Columba Cemetery in Ottawa. She was born October 8, 1921 in Ancona the daughter of William and Elizabeth (Jennett) Tullis. She married Albert G. Yedinak on May 7, 1947. He preceded her in death in 1981. She is survived by sons, James (Sonya) Yedinak of Colorado and Daniel (Sandra) Yedinak of Springfield; grandchildren, Cynthia Yedinak and James Yedinak, Jr.
She is preceded in death by her parents; her husband; sisters, Rita Greener and Jule Winterrowd; and a brother, William Tullis. She attended Ancona Grade School and graduated from Long Point High School in the class of 1939. 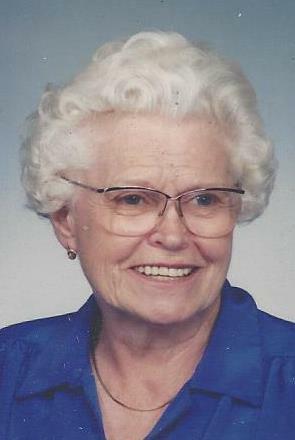 Through the years she lived in Ancona, Eagle Township, Streator, Ottawa and Colorado. She was a member of the former St. Anthony Church, the altar and rosary society of her church and the Long Point American Legion Auxiliary. During WWII she went to New York and worked at the Brooklyn Navy Yards until the War ended. She worked at Handy Foods in Ottawa for 20 years. She later moved to Colorado Springs where she spent 21 years doing a lot of volunteering and helping seniors. She also enjoyed traveling and saw a lot of interesting places from coast to coast.